We designed Proloquo2Go’s grammar support popups to make sure each included language’s whole grammar is accessible. 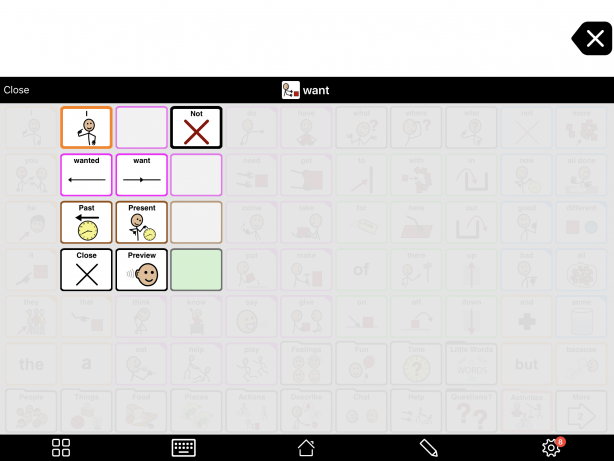 But, it can be overwhelming for many new AAC users to have every form of every word. You can set Proloquo2Go to only show grammar support popups for certain word kinds. You can also make only some tenses available. Or, you can turn off grammar support completely. To adjust the grammar support settings, first go to Options* at the far right of the bottom toolbar. Then, go to Grammar. 1. To turn off grammar support entirely: Toggle Grammar Support to OFF. 2. 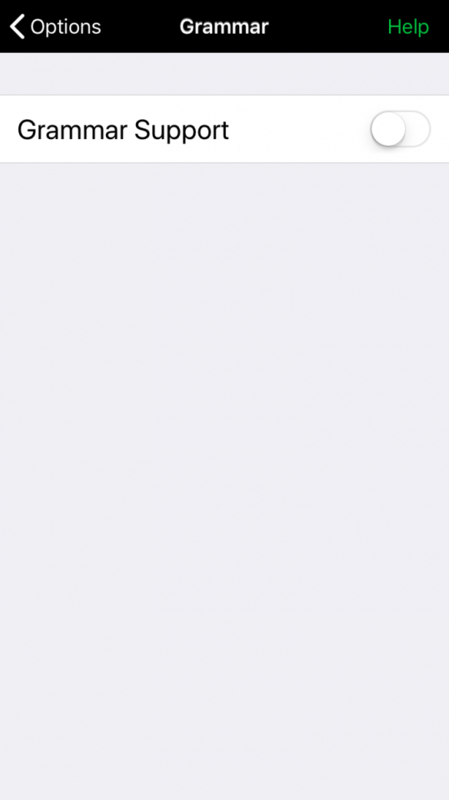 To turn off grammar support for some word kinds: Change those word kinds' toggles to OFF. 3. 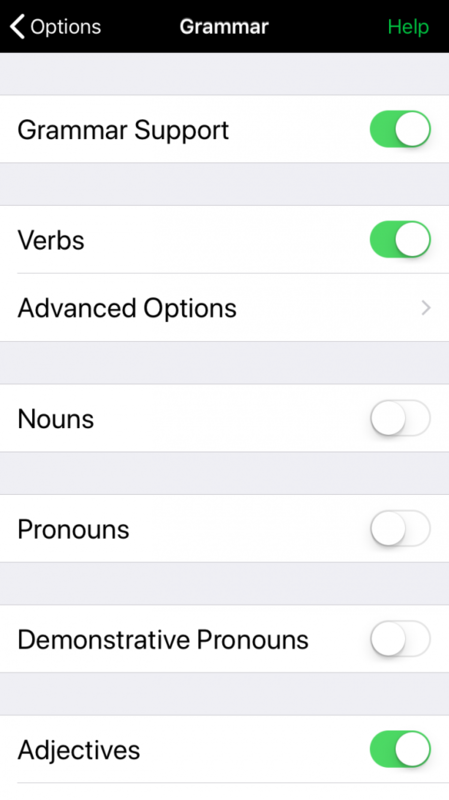 To show only certain tenses: Tap Advanced Options under a word kind. Toggle all tenses OFF, except the ones you want available. 4. To simplify navigation in verb popups, scroll down to the very bottom of the list of tenses. Toggle the settings under Folders OFF. When you are ready to introduce new grammatical forms, you can go back into Options > Grammar. Toggle Grammar Support, individual word kinds, or the tenses you want back to ON. 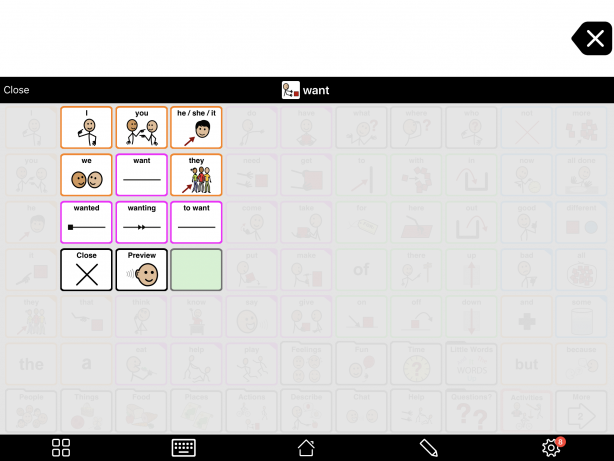 You can learn more about teaching grammar in our Learn AAC article, Teach Grammar. To learn how to find the tense you want, see Find different forms of a word.